The Swedish band Antichrist has been very active with concerts around Sweden and have already a big and loyal crowd. Maybe this number of fans will increase rapidly as they now launch their first real record, Forbidden World. Before that their fans had some demos to their disposal, but Antichrist takes the big step now. It is labeled as thrash metal, but that is not the whole truth, there are tons of dark metal and more traditional heavy metal present in a good and decent mix. Antichrist goes for the throat with fast melodic thrash metal so furious that it invites for more. 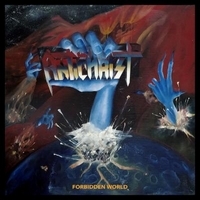 Antichrist is aggressive and serious thrash metal that show what they are up to. Antichrist feels like you are at a consort with Motörhead, it's this kind of metal that should be reserved for Lemmy, but Antichrist makes a wilder version but still with personality as Mr. Kilmister. Dark Sorcery has some genuine dark metal put together with the thrash style that goes like a red thread throughout the album. The two last songs are in the corner where heavy metal camps. Minotaur fills the camp with old school metal very qualified made, Necropolis gives the last kick to register trademark to their crowd.